Impact damage is a turbo killer. 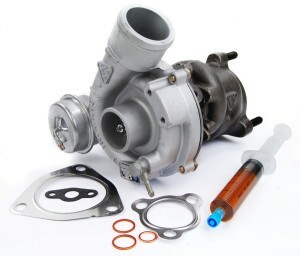 Turbochargers can spin at over 240,000 rpm and they endure temperatures of 950°. They have a very hard life. To put it another way 3-5000 RPS thats revs per second ! As you can imagine during operation at these speeds, even the smallest object ingested or sucked into the Turbo can damage or destroy the compressor and turbine, leading to low pressure or total failure. Even a single grain of sand ! At very high speeds we have noted that the turbo shaft can snap if the foreign object is big enough which in turn can cause turbo run on – this occurs when the engine runs on its own oil ! Its scary and in many cases causes engine damage or failure. Impact damage has far reaching effects…. 1 – Items sucked into the air intake usually caused by poor quality or a missing air filters. 2 – Damaged Turbo hoses allowing small particles of sand or stones to enter the air supply to the turbo thereby by passing the air filter ! 3 – Pieces of gasket material entering the intake along with nuts, bolts, washers rags or other items left in the intake pipe during servicing. 4 – Broken engine components e.g. injector tips, valves, or fragments of damaged piston. 5 – Fragments from a previous turbocharger failure. Ensure all your air hoses are in good condition, and that they are intact and free from any blockages, and there are no loose items in them. Always use brand-new gaskets to ensure a perfect seal which will avoid gasket breakup. Always fit the correct air filter and make sure it’s new. 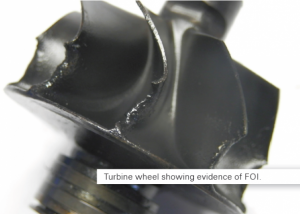 Thoroughly check that there are no turbo or engine fragments in the system from the previous Turbo failure before fitting the replacement item…miss anything and impact damage will leave you with another failed unit.